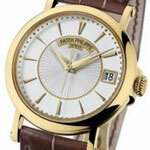 The Calatrava line of watches from Patek Philippe has been joined by yet another addition to the very popular collection, the Calatrava Officier Reference number 5153 is a watch with classic design and beauty. This new addition is only being produced in a single metal, 18 carat yellow gold which and will have a total width measuring 38 mm in diameter. The case has a Bassine-style bezel with a signature turban-shaped crown as well as horns with rounded ends feature visible screw attachments. The sapphire crystal case back is protected by a hinged anti-dust cover which helps create a 30 meters water resistance for the watch. The dial is made in a silvered opaline with a hand-guilloché center and has gold applique hour markers. The gold hands display hours, minutes and center seconds and there is a date window at the 3 o’clock position. The Officier is nicely complimented by the matt chocolate brown large square-scaled alligator strap. The Calatrava Officier is powered by a mechanical self-winding, 324 S C caliber movement which by itself is 27 mm in diameter and 3.3 mm high. The movement is comprised of 213 parts which includes 29 jewels and 6 bridges. The movement has a gyromax balance and has a total of 28,800 vibrations per hour. The movement allows for power reserve with a maximum of 45 hours. 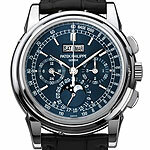 Beginning Spring 2009 Patek Philippe is defining a new standard of quality for mechanical watches with the launch of the brand new Patek Philippe Seal. From now on all of the Patek’s mechanical movements will be embossed with the beautiful new Patek Philippe Seal, just another reminder of the quality the brand delivers. While the well known and highly respected Geneva Seal applies to a timepieces movement, the Patek Philippe brand strives to reach a much higher level of excellence. This inspired the development of a seal that applies to not just the movement but a mark of excellence that applies to the entire timepiece. All cases, dials, hands, pushers, spring bars for straps, and functional aspects of a timepiece bearing the Seal must meet the watch industry’s most exclusive and stringent hallmark of quality. Patek plans to phase out its use of the Geneva Seal which is the hallmark currently used on all the mechanical movements crafted by Patek Philippe, and will be gradually replacing it with its own seal. An interesting difference to the Geneva Seal is the process in which the final rate tests are executed, which are performed with fully assembled watches while conventional tests are preformed on uncased movements. 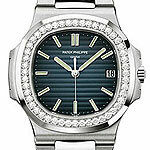 The Patek Philippe Seal guarantees the quality of all materials used in the construction of the watch. As one of the last manufacturers to still keep all manufacturing aspects in house it is one of the rare brands that can oversee and ensure the quality of its product, the Patek Philippe Seal is a great way to remind its customers of this. After great lengths of time spent appreciating the 30 new watches Patek Philippe is adding to its collection this year, the two that I kept being drawn back to were the Celestial 5102PR and the Gondolo 5098R. Both timepieces have been previously released in different metals, yet I can't help but admire how these two timepieces are exquisite both technically and visually. Patek has stated that the highlight of the collection is a number of watch models in new rose gold version that "radiate the magical warmth of this precious metal." In the case of the new Gondolo 5098R I say this is an accurate description for this stunning model. The Mens Gondolo model 5098 was previously released in platinum back in 2007. 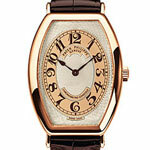 The tonneau shaped case was inspired by the historic Patek Philippe Chronometer Gondolo dating back to 1925. The new version has a beautiful rose gold case and a hand-guilloche two-tone silver and honey brown dial in gold with both Patek Philippe and Chronometro Gondolo inscriptions. Hours are indicated by Breguet numerals with elegant hour and minute hands. The 5098R-001 features a mechanical manually wound movement, caliber 25-21 REC, which contains a total of 142 parts - 18 jewels and has a power reserve of 44 hours. It has a cambered sapphire-crystal case back and is water resistant to 30 meters. The 5102 Celestial was initially launched in 2002, this year Patek will be replacing the current yellow gold model with a bi-color rose gold and platinum version. The watch case is made from rose gold while the bezel is produced from platinum. 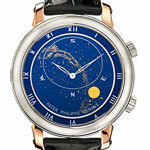 The rare astronomical indication is one of the most impressive Patek creations to date. The watch is powered by a mechanical self-winding movement, caliber 240 LU CL. The dial consists of three metalized sapphire-crystal disc as well as ellipse framing the portion of the sky visible from Geneva. Revealing a complicated sky chart with phases and orbit of the Moon as well as time of meridian passage of Sirius and of the moon. The watch is water resistant to 30 meters. 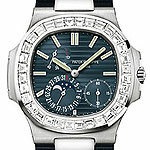 A unique creation by Patek Philippe will be auctioned off at the Tung Wah Charity Night Auction in Hong Kong. The 5970 in platinum is the only one of its kind, created especially for this event. The auction organizers, Tung Wah Group are one of the oldest and the largest charitable organizations in Hong Kong. The auction will take place on March 6, 2009 and will be hosted by Sotheby's. The event is by invitation only, though written bids can be submitted prior to the date of the auction. All proceeds from the sale of the 5970P will be donated. The 5970P is is constructed of 950 platinum and will come with both solid platinum and sapphire crystal case-backs. 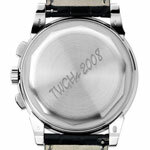 The platinum case-back is engraved with the year and the initials of the Tung Wah Group Hospitals TWGHs 2008. The case has a diameter of 40mm with a thickness of just over 13mm. The dial is a blue metallic sunburst motif which displays both a railway track minute scale and a tachometer. The leaf shaped hands for the hour, minute, 30 minute counter, sub seconds, and calendar are all crafted from 18 carat white gold. The watch comes on a hand-stitched matt black alligator strap with a prong buckle in platinum. 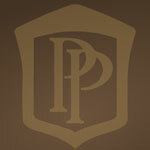 This year Patek Philippe has unveiled the Pulsomax Ref. 5450, a new annual calendar watch. This limited edition of 300 platinum watch includes the newest technological development from Patek, the Pulsomax® escapement. It features a trilogy of Silinvar® components which provide a greater degree of accuracy and precision. Because Silinvar® is made from the chemical compound silicon dioxide, also known as silica, it is anti-magnetic and therefore is immune to magnetic influence which has caused disturbances in precision time keeping with steel components. In addition it has 1/3 the mass of steel and it is highly resistant to corrosion. With the combination of Silinvar® against Silinvar® the movement does require lubrication because of the low amount of friction created. All of these advancements means the time between required servicing of the watch is greatly increased. Over the past few years Patek Philippe has been changing the world of mechanical watches, and showing their superiority over other manufacturers with their bold new ideas and technology. The Pulsomax® is bringing watchmaking to a whole new level in the 21st century. The ladies Twenty~4 watch from Patek Philippe was first introduced in 1999, it was created to be a contemporary version of the Gondolo ladies model and was insiped by Art Deco design. The collection also includes a line of Twenty~4® rings and earrings that compliment the various designs. They are available in stainless steel, rose gold, yellow gold and white gold. Each Twenty~4 has an onyx or a diamond solitaire on the crown. 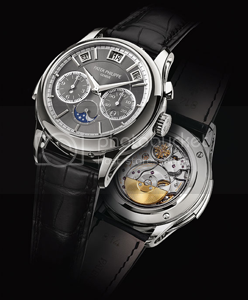 The two newest addition to Patek's Twenty~4 collecion are the 4910/52G and the 4910/48G, each only produced in 18k white gold. The first new Twenty~4 is model 4910/48G has a medium case size that is 25 x 30mm and has been set with diamonds in a beautiful Art Deco inspired pattern. 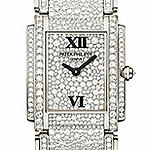 It has a total of 500 diamonds with 499 set on the case, dial and bracelet and a single diamond set on the crown. The silvery sunburst dial displays hours and minutes and has diamond-set Roman numeral markers at twelve and six o'clock. The ultra thin Caliber E 15 quartz movement has 6 jewels and 57 individual parts and is marked with the geneva seal hallmark. The second new addition to the Twenty~4 collection is model 4910/52G also has a medium case size that is 25 x 30mm. The case, dial and bracelet have a custom pave diamond setting which unlike most pave settings uses several sizes of diamonds to create a unique effect. There are a total of 2458 diamonds included in the overall design with 12.65 carats on the case, dial and bracelet and a single 0.05 carat diamond on the crown. The ultra thin Caliber E 15 movement has a diameter of 16.30 mm and is 1.80 mm thick. The battery life is about three years. 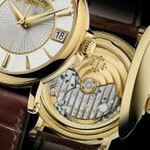 Patek Philippe has introduced a new Nautilus for its Joaillerie collection. 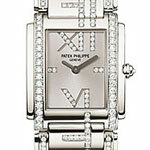 The new white gold model has a 40mm case and is set with 48 round brilliant-cut diamonds. Unlike other white gold nautilus models which have tradionally been on straps, the 5713/1G model has an 18k white gold bracelet. The black-blue shaded dial has gold applied hour markers with luminescent coating and displays hours, minutes, seconds and date. Patek Philippe used their Caliber 324 S C movement, it is comprised of 213 hand-finished components and measures 27mm by 3.30mm. It also features a Gyromax balance wheel, Geneva Seal hallmark, 29 jewels, 45 hour power reserve, and it produces 28,800 vph. The water resistance of this model is rated at 120 meters. Another new edition to the Joaillerie Nautilus collection is the 5722G, a beautiful complicated Nautlius watch set with 32 baguette diamonds. 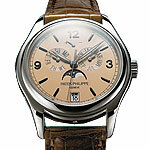 This complicated timepiece features moonphase, pointer-style date and power reserve indicators. The 40mm case is white gold and has a sapphire crystal caseback. 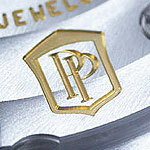 Patek used their caliber 240 PS IRM C LU movement which is stamped with the coveted Geneva Seal. The strap is made from shiny navy blue alligator with square scales that is hand-stitched. Though Patek Philippe's archives do not indicate which is true, it is thought that the name Nauitlus was inspired by either the vessel in the Disney movie Twenty Thousand Leagues under the Sea (1954) or the US Navy's first nuclear powered submarine. Designd by well known Gerald Genta, it was first introduced by Patek Philippe in 1976 and was one of the world first sport watches. The Nautilus is easily distinguisable from other Patek models by its trademark rounded octagonal bezel.